The Yezidi (Yazidi) cosmology and religion is non-dual. They acknowledge an inactive, static and transcendental God, the “Supreme Being,” who created, emanated, or “became” the Seven Great Angels. The first and leader of the Seven Great Angels is Tawsi Melek, the Peacock “King” or Peacock “Angel”. Soon after the Earth was created it began to shake violently. Tawsi Melek was then dispatched to Earth to stop the planet’s quaking, as well as to endow it with life, beauty and abundance. When Tawsi Melek descended to Earth, he assumed the form of a glorious peacock – a bird full of the seven colors. Landing in a place now known as Lalish, Tawsi Melek transferred his peacock colors to the Earth and endowed it with a rich flora and fauna. Tawsi Melek then traveled to the Garden of Eden to meet Adam. The first human had been created without a soul, so Tawsi Melek blew the breath of life into him. He then turned Adam towards the Sun, symbol of the Supreme Creator, while stating that there was something greater than a human being and it should be worshiped regularly. Tawsi Melek then chanted a prayer for all humanity to daily repeat to the Creator, and he did so in the 72 languages that were going to be eventually spoken by the 72 tribes that were destined to cover the Earth. Then Eve was created. But according to the Yezidis before copulating the primal couple enrolled in a kind of competition overseen by Tawsi Melek to see if either of either of them could bring forth progeny independent of the other. They both stored their seed in a sealed jar and then after an incubation period opened them. Eve’s jar was opened and found to be full of insects and vermin, while inside Adam’s jar was a beautiful boy-child. This lovely child, known as Shehid bin Jer, “Son of Jar,” grew quickly, married, and had offspring. His descendants are the Yezidis. Thus, the Yezidis regard themselves descendants of Adam but not Eve and the special People of the Peacock Angel. In the 11th century CE the Yezidi culture was reformed by the great Sufi, Sheikh Adi, who oversaw the final modifications that shaped the Yezidi religion down until the present time. Under the unseen guidance of Tawsi Melek, Sheikh Adi composed a scripture, taught hymns and prayers and established the current Yezidi caste system. 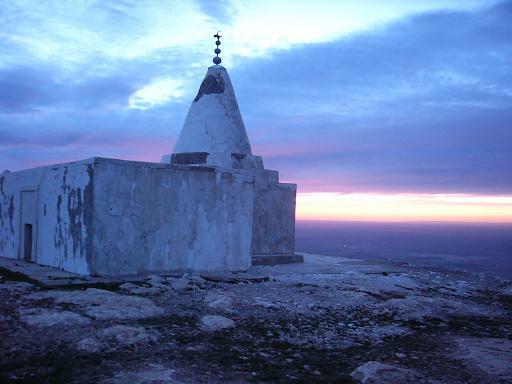 Sheikh Adi was entombed in Lalish, the ancient spot where the Peacock Angel first landed, making it the spiritual heartland of the Yezidis. The Yezidis always had a caste system since their founding in the Garden of Eden. Their caste system was updated and revised by Sheikh Adi, who established the current strata of classes. At the top of this hierarchy is the Yezidi Prince, the “Mîr,” and his relatives. Together they compose their own Mir Caste. Below the Mir Caste is the Sheikh Caste headed by the Baba Shiekh, the Yezidi “Pope.” Below the Sheikh Caste are the Pir and Murid Castes. The majority of Yezidis are Murids, meaning “commoners.” Then there are the orders of the mystics, the Faqirs, Qewels, and Kocheks, who can be members of any caste. The Mîr or “Yezidi Prince” is the temporal and religious head of the Yezidis. He is recognized by the Yezidis to be the official representative of Tawsi Melek on Earth and represents his people at all national and international conferences. The role of Mîr is hereditary and currently drawn from one of the Sheikh families, the Çol family. Legend states that when Tawsi Melek was sent to Earth he proceeded to create a man from the spirit world or void, which in Kurdish translates as ‘çol’. This man and his eventual descendants then assumed the title of Mîr. Initially they were given as their palatial seat the village of Baadra in the Sheikhan region of the Yezidis, but they currently reside in the Sheikhan town of Eyn Sifni. The Sheikh caste is the highest and most honored of the three castes below Mir. As mentioned, the highest offices within the Yezidis are drawn from it. Sheikh is an Arabic word that denotes a ruler, elder of a tribe, or a revered holy man. The Sheikh Caste was founded by Sheikh Adi and originally drew its membership from the families descended from six of the Seven Great Angels (excluding Tawsi Melek) who had taken physical incarnation when Sheikh Adi was in body. Membership in both the Sheikh Caste and the Pir Caste has become hereditary and often comes with special abilities. Each Sheikh and Pir family, for example, possesses some healing ability. Some families can cure snake bite, others madness, others fever, headache, arthritis, etc. A family’s spiritual power can be transferred to a sick person through the saliva of one of its members, or via soil from the family shrine. The members of the Pir Caste are descended from Peer Alae, a holy man who had lived during the time of Sheikh Adi and was blessed with miraculous powers. Pirs are also said to be descended from the 40 or 42 disciples of Sheikh Adi. A Pir, which is a Kurdish word meaning “elder,” is an important mentor and official at all important Yezidi functions and meetings, both temporal and religious. Both Pirs and Sheikhs assist with marriages, circumcisions, funerals, and they take on the role of family advisor. Yezidi families of all three castes are required to adopt one Sheikh and one Pir as their guides for life. The Murid Caste consists of the majority of Yezidis. The Murid Caste is the caste of “commoners” who generally do not serve the function of priest. The Faqirs are recognized to be the highest of Yezidi mystics. The name Faqir, meaning “Poor One,” is another name, for a Sufi. It is similar to the term “Dervish.” The Faqirs are directly descended from Sheikh Adi, himself a Faqir, and all those ascetic and enlightened Sufis that assisted him during his life. The Faqirs are the experts on the Tawsi Melek and teach his legends and teachings. They often carry a flask of sacred water to bless people, and it is said that they can even initiate a seeker into spiritual life through transference of spiritual power. They wear the sacred goat vest (the goat is a sacred animal among the Yezidi) as well as other distinguishing accouterments, such as the traditional coarse black shirt and black turban of a Sufi Faqir. In whatever community they reside within they assume the role of chief priests and wisdom keepers. Often they are supported by other villagers through alms and tithing. The Qewels are the bards and sacred singers. They bring forth religious knowledge, sacred hymns, songs and stories at special Yezidi gatherings and ceremonies, and they do so to the accompaniment of flutes, tambourines and other sacred instruments. Their roles are hereditary, and their wisdom is normally passed from father to son. They reside principally in the Beshiqe-Behzani region of northen Iraq. The Kocheks, or “seers,” are servants of the Sanctuary of Lalish. Because they are blessed with spiritual gifts, such as clairvoyance, they can psychically diagnose illness and they even know the fate of a soul after leaving the body of the deceased. There are only a few Kocheks left, and they mostly reside in the Sinjar Mountains of northern Iraq. The female counterpart of Kocheks are known as Faqras. They are recognized as holy women with supernatural power. Kocheks and Faqras can come from any of the three main castes. The Yezidi New Year, known as Sere Sal, meaning “Head of the Year”, is celebrated on a particular Wednesday of April, known as Red Wednesday. This day commemorates the Wednesday that Tawsi Melek first came to Earth millions of years ago in order to calm the planet’s quaking and spread his peacock colors throughout the world. Part of the New Year celebration is the coloring of eggs, which collectively represent Tawsi Melek’s rainbow colors that he blessed the world with and displays in his form of the Peacock Angel. The eggs are principally colored red, blue, green and yellow. Women also place blood-red flowers and shells of the colored eggs above the doors of the Yezidis so that Tawsi Melek can recognize their abodes. New Year day begins with a banquet to honor the dead. At dawn, all Yezidi women go to the nearby cemeteries with pots of food while men remain behind in the villages. The graves quickly become transformed into tables for many plates of food, colored eggs, red flowers and framed photos of the deceased. While going from tombstone to tombstone the women eulogize each of the deceased with mournful singing and wailing. Afterwards tablecloths are spread on the ground between the graves and the women proceed to feast upon the offered food. Meanwhile, back in the villages, the men congratulate each other at the beginning of the New Year. One of the most important events of the Yezidi New Year is the Parade of the Sanjaks or Parade of the Peacock. Bronze lamps surmounted with peacocks are paraded through many of the Yezidi villages. The Sanjaks were given to the Yezidis by Tawsi Melek and are the most precious sacred objects among the Yezidis. Originally there were seven Sanjaks, one for each of the Seven Sacred Angels, but five were taken in 1892 by the Turkish Moslems. Of the two remaining Sanjaks, the largest and most sacred one is the Sheikhani Sanjak, the Sanjak directly associated with Tawsi Melek. The two Sanjaks are taken in procession to the Yezidi villages by the Qewels, who then remain in each village for one night while giving discourses to the inhabitants on Yezidi spirituality. Around mid-February is a forty day fast which is observed only by Yezidi holy men in Lalish. At the completion of this fast is the Feast of Sacrifice, which commemorates when Abraham attempted to sacrifice his son Ishmail but then replaced a sheep for his son. On this day Yezidi also sacrifice a sheep, whose blood is believed to wash away their sins. 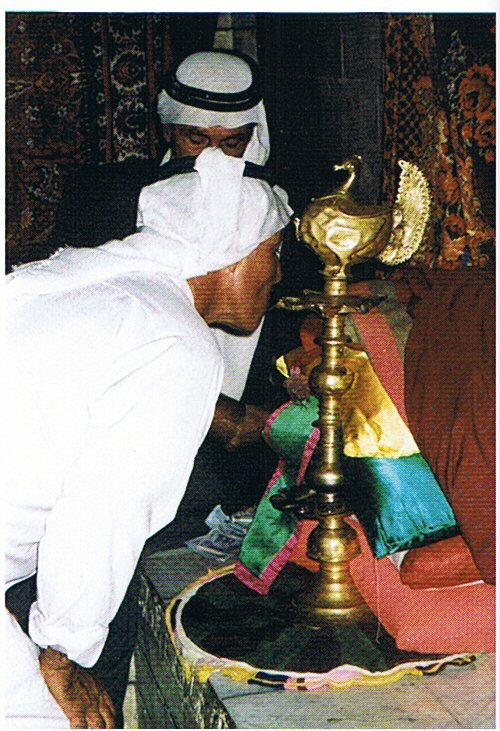 The Baba Shiekh and other religious leaders sacrifice a sheep in Lalish. After making a pilgrimage to Mt. Arafat, the Lalish group sacrifices their sheep and then light sacred fires all over the valley. At night they perform the Evening Dance, wherein the head of the Faqirs leads the Yezidi priests in a sacred procession. Observed during the beginning of October, the Feast of Seven Days, known as the Jema’iyye and referred to as ziyaret, “the pilgrimage”, is a sacred time when all Yezidis attempt to make the pilgrimage to Lalish in order to to unite as one people at their holiest shrine. Prevailing belief has it that there is an upper or heavenly Lalish where the Seven Great Angels gather at this time to shower there blessings on those assembled at the lower or worldly Lalish. Throughout the week-long event friendships are rekindled and important meetings take place among the Yezidi leaders, with both the Mir and Baba Sheikh in attendance. The two most important events of the Feast of Seven Days are the Evening Dance and the Sacrifice of the Bull. The Evening Dance is performed by religious dignitaries every evening just after sunset in the court of the Sanctuary. Fourteen, or twice seven, men dressed in white, the color of purity, step to the music of Qewels. They proceed in procession around a sacred torch that represents both the Sun and the Supreme God.. They are led in this walk by the head of the Faqirs, who is dressed in a black fur cape and conical hat – sacred articles allegedly once worn by Sheikh Adi himself. The Three Day Fast of December is one all Yezidis are expected to observe. Fasting occurs from dawn until sunset, and the nights are given to feasting, merry making and some prayer. Yezidis have five prayers they repeat daily: Nivêja berîspêdê (the Dawn Prayer), Nivêja rojhilatinê (the Sunrise Prayer), Nivêja nîvro (the Noon Prayer), Nivêja êvarî (the Afternoon Prayer), Nivêja rojavabûnê (the Sunset Prayer). However, most Yezidis only observe only two of these, the sunrise and sunset prayers. The Yezidi worshiper knows to turn his or her face toward the Sun during his or her worship, just as Tawsi Melek taught Adam, but if they observe the noon prayer they face Lalish. Prayers should be accompanied by certain gestures, and they must not be performed in the presence of outsiders. Wednesday, when Tawsi Melek first came to Earth, is the holy day when most prayers are observed, but Sunday, the day that the Peacock Angel was created, is also special. Saturday is the weekly day of rest and rejuvenation. After death the body is washed, and clay or water from Lalish is placed in the mouth of the deceased. The body is buried immediately thereafter, the head pointing east and the face turned toward the north star. The procession to the cemetery is accompanied by singing, and for a man, possibly a dance performed by his mother or wife. The Yezidis believe that at death they are brought into the presence of Sheikh Adi on the Sirat bridge for interrogation. The three questions are then posed to them covering their past sexual lives, including whether they married or had sexual relations with a non-Yezidi or someone of another cast. If their answers are acceptable, then Sheikh Adi acts as their intercessor with the Most High in order to move them into Paradise. During life each Yezidi undergoes a ritual wherein they become bonded to a “brother” or “sister” from a family different from the one they are born into. The sibling relationship thus established is to assist the Yezidi in the next world. According to tradition, your heavenly brother or sister will be waiting to assist your soul when you depart from this world. There are different theories regarding Heaven and Hell among the Yezidis. Some believe that Tawsi Melek created both Heaven and Hell and that a truly evil person is a candidate for the underworld, while other Yezidis believe that Tawsi Melek cried for seven-thousand years and extinguished the fires of Hell, thereby eliminating it. From this latter perspective all souls will either reincarnate in to a human form or ascend to Heaven for an eternity. The Yezidis believe that they will continue to reincarnate until they achieve a certain level of soul purity. At that time they will be eligible to enter a heaven realm and exist there for an eternity. There is also the unusual belief that if a Yezidi soul becomes very impure through the performance of evil actions while on Earth it is liable to reincarnate into the body of a person associated with a different religion, such as Islam. The greatest punishment is to be evicted from the Yezidi religion. Christians and Yezidis have been friends for centuries. During the Turkish-Armenian war the Yezidis saved many Christians who fled the Turkish Moslems and took them into their own homes to hide them from certain death. Some Yezidis even purchased the freedom and safety of Christians from the Turks for a certain number of gold pieces. Their generosity and compassion was later returned by the Christians when, during a period of persecution beginning with the reign of Sadam Hussien, Christian organizations helped the Yezidis flee to Europe and America and became settled in new communities in those foreign lands. The peacock has always been a popular and fortunate symbol among Christians. During the early days of Christianity it was used interchangeably with the symbol of the phoenix, both of which were the symbols of resurrection and the arisen Christ. To Christians, the peacock’s “eyes” were also symbols of omniscience and represented the all-seeing God. The Catholic Church made the peacock its first official symbol, claiming that the eyes on the peacock’s feathers denoted the “all-seeing church.” Later, during the Middle Ages, many of the greatest European painters portrayed Jesus in the midst of peacocks and also attached peacock feathers to their depictions of the heavenly angels. The Yezidis recognize Jesus to be one of the great prophets sent to Earth by Tawsi Melek. Today, they even repeat his name in some of their prayers. Yezidis also claim that one of their own, a woodcutter named Yosef Nagar, lived in Jerusalem when Jesus was a boy and taught the future prophet certain healing practices and the art of herbalism. Within the canon of Yezidi legends one can find stories about how Tawsi Melek was a guide and helper to Jesus. In this regard, it is believed by the Yezidi that God sent Tawsi Melek to move the stone that blocked Jesus’ tomb and was the angel that stayed nearby after it was opened. Sheike Adi was also a lover of Jesus. One of Adi’s important influences was the Sufi al-Hasan al-Basri who proclaimed “There is no mahdi but ‘Isa (Jesus)”.